At last some astrophotographer-friendly weather conditions! Ever since February seeing conditions have been very poor and I have only managed to shoot 3 images in March. First of which was of the Leo triplet, that – as the name may have given away – is situated in the constellation Leo. The bottom galaxy (NGC3628) is seen ‘edge on’ and the disc of dust causes the galaxy to appear as 2 bright lines. 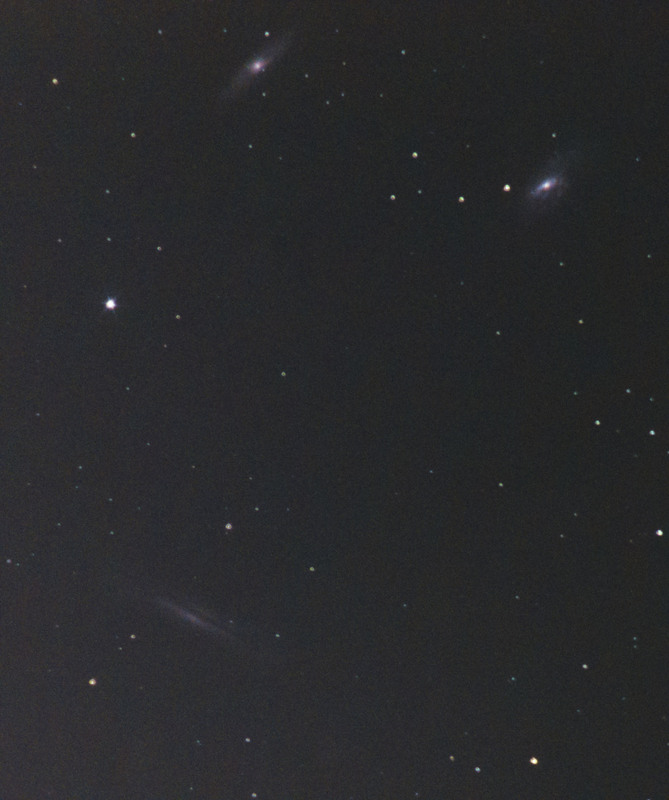 The other 2 are M65 and M66. All 3 are spiral galaxies. The number of nice globular clusters visible in March in the Netherlands (at a reasonable hour) is rather low. The best is probably M3, which I decided to give a go. The result is the image below. Locating the cluster was hard because it was rather low near the horizon and nearby soccer field lighting made things even more difficult. Globular cluster M3 contains the mind blowing amount of half-a-million stars and lies about 34 thousand light years from Earth. 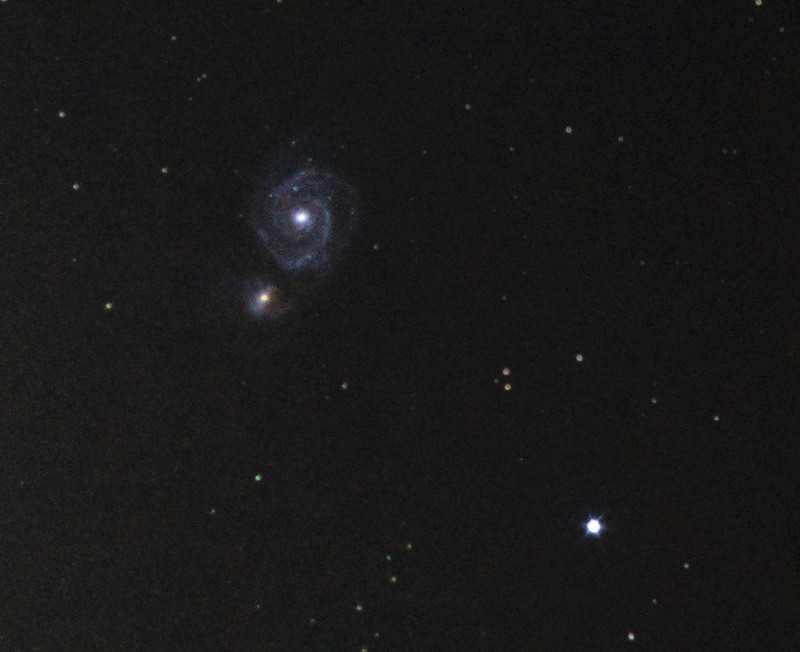 The last image from the one night I imaged in March, is one of M51. 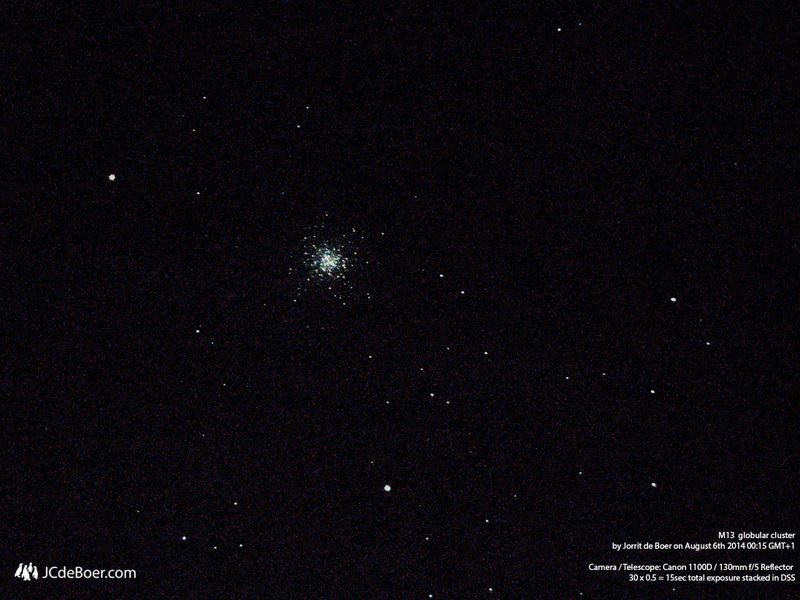 I also imaged this object in February, but at that time it was very low and I didn’t take as much frames as I did now. The image below shows clear blue-purple spiral arms, but I think I haven’t gotten focus quite right when I took the photos. Two nights ago was the first clear night of April in this area and I just couldn’t resist to get the telescope out again. 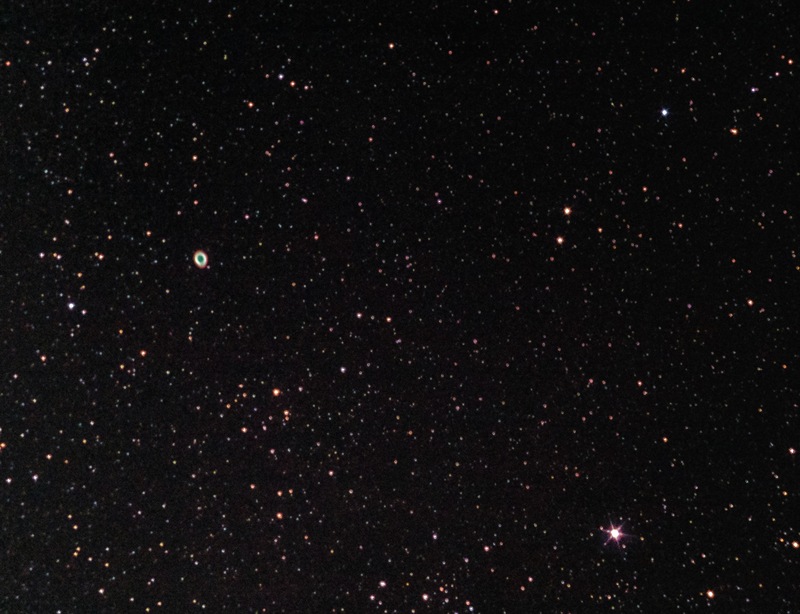 Just after midnight, the constellation Lyra was high enough for the Ring Nebula to be imagable from The Netherlands. 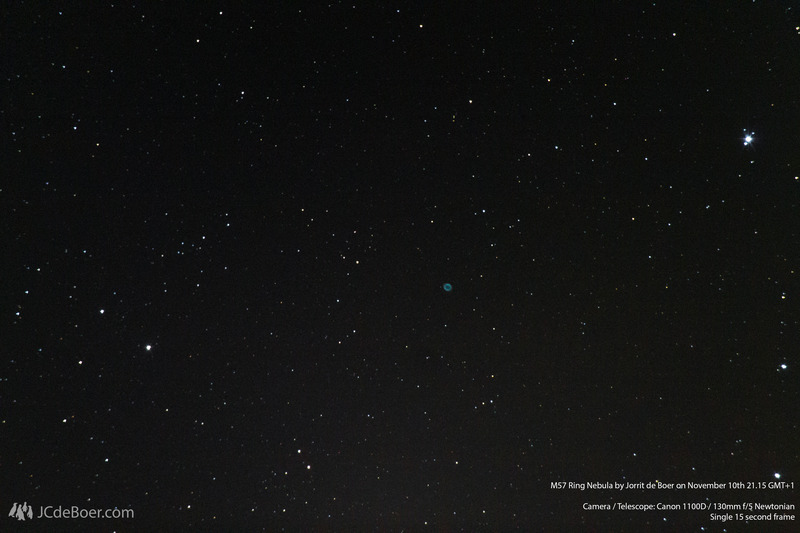 I have imaged planetary nebula M57 before, but it only showed a green ring and nothing of the yellow and red assymetry was visible. The image below is the result of a 30 frame stack, 30 seconds each and shows a very bright Ring Nebula with the colors I missed before. 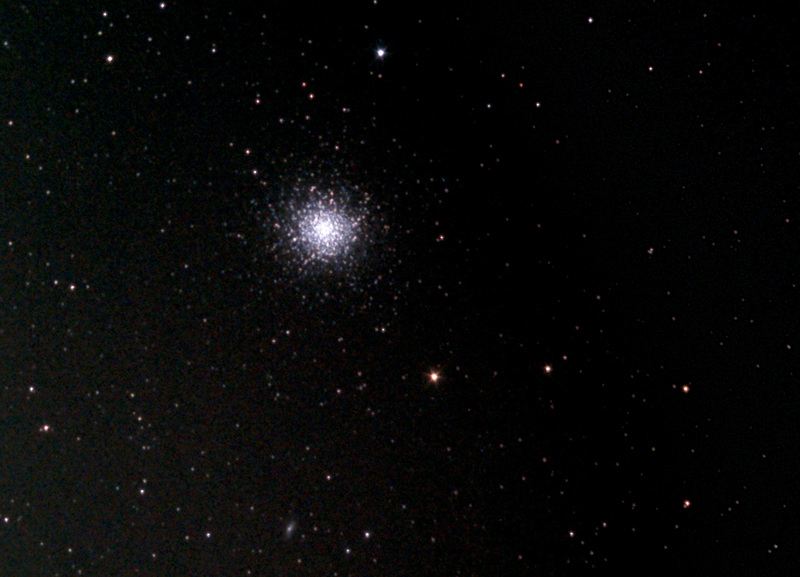 The other deep sky object I imaged was the greatest of all globular clusters: M13 in Hercules. 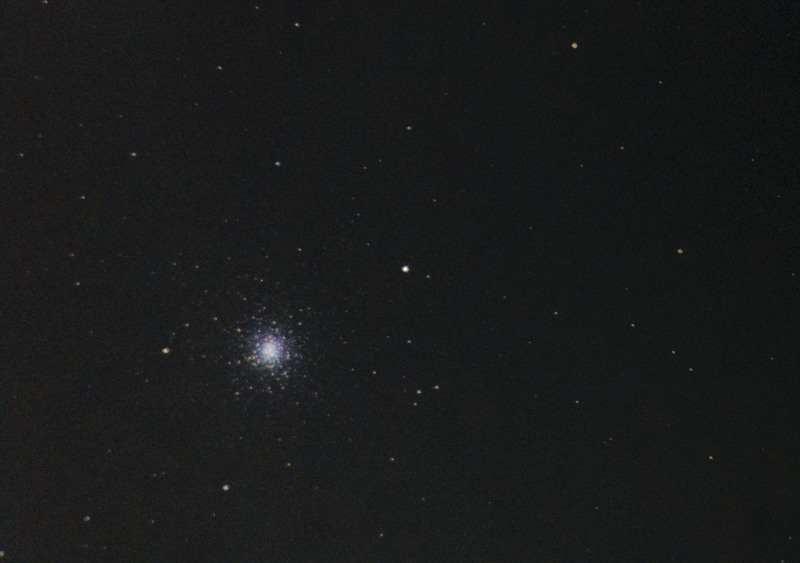 I have also imaged M13 before and again I am happy with the improvement. It appears way larger than M3, but that is probably due to it being closer to us (25 thousand light years) because it contains about 200.000 stars less than M3. A nice bonus is the smudge in the bottom of the last image. It is galaxy NGC6207 located some 46 MILLION light years from here. So the light emitted by NGC6207 has traveled for 46 million years only to end up in my camera sensor. Unless I have missed some other distant smudge in one of my images, this probably is the oldest light my camera has ever caught! This entry was posted in Astronomy, Astrophotography and tagged galaxy, galaxy cluster, Globular Cluster, leo triplet, M13, M3, m51, m57, M65, M66, NGC3628, NGC6207, Open Cluster, planetary nebula. Bookmark the permalink.